Some of the most famous criminals in the world were known to be quite courteous. John Dillinger (1903-1934) being one – graciously tipping his hat to the female bank tellers he was about to rob. In the 17th century, the French-born highwayman Claude Duval (1643-1670) is said to have been very charming during hold-ups on the English country roads: he would dance with the ladies before making off with their money and jewelery. Going a step further was John Clavell (1601-1643), who published a leaflet on the habits of criminals – after all, he also was a author, playwright and poet. He advised people not to be on the road on Sundays, it being the most popular day for hold-ups – including his own best day for business. Nowadays, the most popular day for bank robberies is Friday… while every day of the week appears to be popular for bankers to rob people of their money. These banker robbers are mostly old gray men in funny suits but notice that the fashionable highwaymen hardly had bonus days. 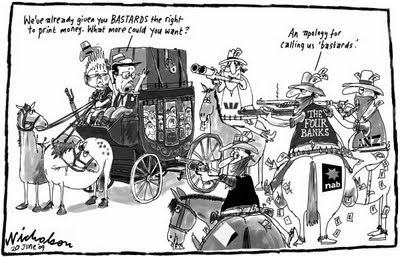 Four Banks Highway Robbery by Peter Nicholson, witty cartoonist with The Australian. 08/04/2009. Category: famous. Tags: banks, claude duval, crime, john clavell, john dillinger.